A few days ago, I participated in a workshop in the Netherlands that focused on the perspectives that emerge around a crisis and how to deal with them as an outsider. The crisis in this case is Ebola in Liberia. The perspectives are the myths or narratives that have crowded around Ebola since the disease broke out in Guinea, Sierra Leone and Liberia. One of the first narratives was the denial of the existence of the disease. It was believed it was a form of Malaria, or that it was a story concocted by the government to divert people’s attention from real issues. These narratives were soon replaced by other myths about Ebola being invented in a lab in Sierra Leone with the single goal of reducing the black population. There were those who believed that it was a punishment from up high or that the ancestors were angry with the people for the wrongs they might have committed. Others feared that is was the health workers who were actually spreading the disease. One Dutch scientist, Johan van Dongen, got in touch with me, claiming that Ebola was fabricated in the sixties, and that he had been conducting research on the disease since the seventies and had written extensively about it. These myths stem from the desire to explain Ebola, in a culture in which governments are almost always mistrusted, and in which superstition reigned. But even more than these two factors, there is the innate human desire, in the absence of a clear cut explanation, to find a culprit, to find something or someone to which the presence of a killer disease can be attributed. And there is, of course, the scientific narrative which is often approached as the only viable narrative by outsiders approaching the affected for the first time. The absence of an effective cure complicates matters and makes this narrative as vulnerable as the others. What is remarkable about these narratives is that they still live on months after the disease first struck that part of West Africa, and they will continue to do so long after the disease has been defeated. With these narratives, these myths, comes the hysteria, as in the case of the American health workers who have been quarantined against their will, all because a politician wants to score a point. Such overreactions results in stigmatizing the affected and every one related to them. Last week, a ten year old son of a friend was bullied out of a soccer field and told to return to his ‘Ebola country.’ The boy’s father is Ghanaian, his mother Dutch. And now we hear that Australia is banning flight from West Africa. 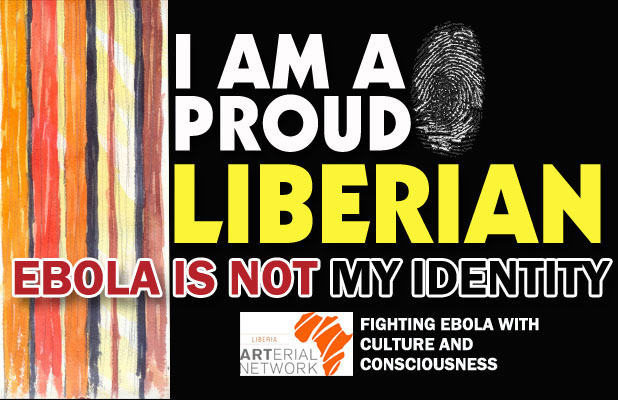 Liberians, confronted with such onslaughts, have resorted to campaigning against this stigma, coming together to tell their own stories, to share their ideas and feelings of helplessness with each other, to make their voices heard. We did not ask for Ebola. Unlike the civil that tore the country apart, Ebola happened to us. And it is still killing us because we don’t have the means to fight it effectively. I told the organizations present at the workshop that when approaching people in the affected areas, they should do so in a dignified and humane way, and they should continue to take into account these various narratives that shaped and will continue to shape the Ebola crisis. It’s not the Liberians’ fault, despite the false claims, that a disease appeared out of nowhere and is killing them in droves. ‘Ebola is a poor man’s disease,’ Kofi Annan recently said. I hope he’s wrong. I hope that the world responds to Ebola not as an African disease but as a disease whose presence concerns us all. Then the Ebola story will not be a poor man’s story but the story of the world. Vamba Sherif is a Liberian novelist and journalist, based in The Netherlands. Photography credit: Bush Child by Chase Walker.